For the ultimate sleep experience: The Electric Adjustable Prodigy is here. Its a foundation... its a base....it can even stand-alone as a simple looking but unbelivably functional bed frame for your mattress. It's sleek design allows for multiple set-ups and can be dropped into almost any bedframe. We put it inside our Greenwhich Bedframe and both the frame and the bed (even the Utopia Silver mattress on top) quickly became the main attraction & most popular features of our showroom. Electric Adjustable Beds aren't just for hospitals anymore and with our Prodigy base they no longer look like hospital beds either. Sure, The Prodigy goes up & down in 3 different zones (head, middle, foot) for whatever comfort setting you wish - and yes it has a wireless remote control. But it can also deliver a full body massage at the touch of a button while powering up your devices on its built in USB ports. Push another button to light up your bedroom floor with its sleek underbed lighting system. Select one of the pre-set (professionally engineered) sleep posititions including the "zero-gravity position" and many other professionally recommended sleep positions available. Or just set your own. With one touch, your bed moves to whatever position you desire. You're the boss with this bed. WallHugger / FrameHugger engineering allows this base to be dropped into virtually any standard size bedframe from Twin to CalKing which means you can hide it in whatever frame you already have (or want to get) to preserve the look of your room. The Prodigy Foundation is an electric adjustable base with legs that moves your mattress to whatever position you desire at the touch of a button on it's wireless remote. 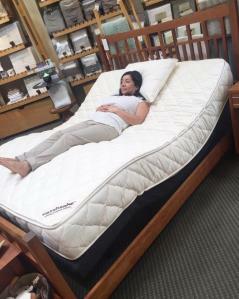 It works with virtually any latex mattress and even some micro-coil mattresses. It can stand alone or be dropped into virtually any bed-frame to create or maintain the look you want. Added features like "Zero-Gravity" position, App Controls, Full Body massage, MicroHook Retention, USB Ports, and Under-Bed Lighting make this a technological bed for the ages. 6" foundation on adjustable legs for adjustable height. Sizes: Twin (38x75¨), Twin-X Long (38x79¨), Full (53x75¨), Queen (60x79¨), Dual-King (76x79¨), and CA King (72x83¨). Sleek design fits within almost any standard bed-frame - just remove the slats or cross supports on your bedframe and drop this foundation base inside. It stands on its own adjustable legs and becomes the platform/foundation for your new latex mattress. No boxspring, wood foundation, or slats necessary. Allow 2-4 weeks for production then 2 weeks for delivery. You can call us to inquire about an ETA for your order. After your items are produced you will be contacted to schedule a date and time for your home delivery or pick-up. The Prodigy comes with a standard 25-year manufacturers warranty (1,3,25) covering any manufacturing defects. They are also insured to cover any damages caused during a home delivery. Once signed by the receiving party, the responsibility of proper care is yours. In accordance with health code laws, mattresses & foundations are non-returnable & non-refundable.